Thread: Rel Next/Prev it appears is not needed ! It does appear we can reliably rely upon Google to not tell us anything, LOL. 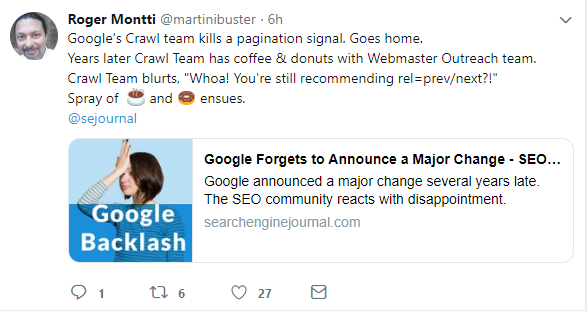 All of the paginated content we so carefully add re=next/prev to, well Google apparently pays no attention to this markup and they don't use it. Google seems to think we build excellent sites, LOL, Here's the article, image is linked. This is the kind of thing that frustrates many webmasters and SEOs that spend time implementing it. The hint that sites were structured such that it was easy for Google to consolidate them, could it be from the pagination that has been used. This brings about the question, does it matter from our perspective, meaning is there a better way to organize the pages. I mean how else would your organize 100 pages of "iPhone earbuds"?